This lovely collection of vintage Miriam Haskell jewelry from the 1930s-1970s features designs in the high-quality components – pearls, beads, and other unique materials – that have defined her brand. Many by Frank Hess, chief designer until 1960, are included. In addition to tailored, classic necklaces, earrings, brooches, and bracelets, you will find whimsical jewels in surprising materials. For example, during World War II, when components from Japan and Europe were not available, Haskell used American-made plastics and natural materials (such as wood). The only pieces in this boutique made more recently than the 1950s are by this maker. Read more about Miriam Haskell. 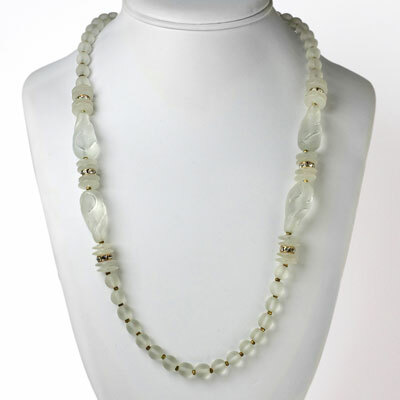 This Miriam Haskell pearl necklace is a beautiful example of this maker’s work. 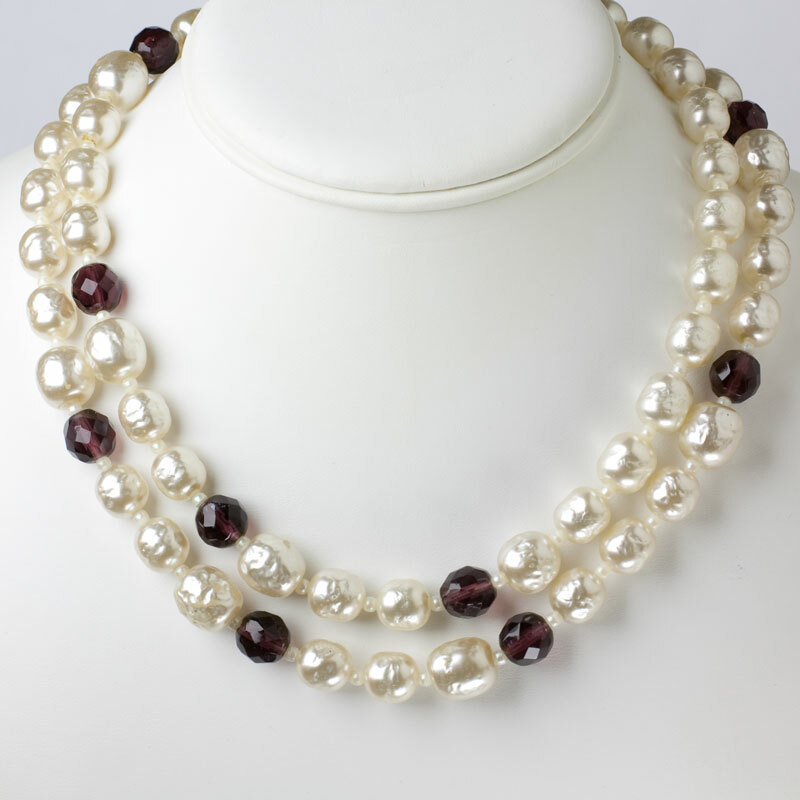 The long strand of faux cream baroque pearls and pearl bead spacers is interspersed with faceted amethyst glass beads. The pearls are textured and somewhat varying in size. Wear this piece as a single long strand or doubled, depending on your neckline and the look you want to create. Although I usually prefer earlier vintage jewels, this beautiful necklace was part of my personal collection because it is so elegant, timeless and versatile. The wear to the nacre of some pearls does not detract in any way from the lovely appearance of this piece. 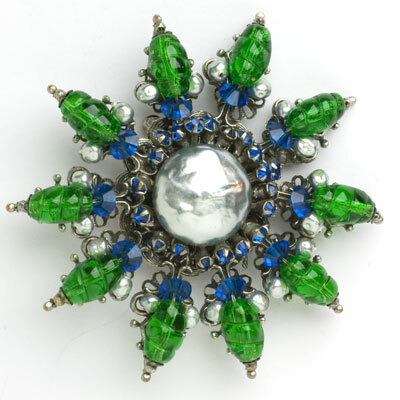 A textured Russian-gold wreath embellished with blue, green, red and yellow glass beads forms the top of this whimsical 1930s brooch by Frank Hess for Miriam Haskell. Note that the beads were hand-sewn onto the pierced metal foundation. Dangling tubes and beads in the same colors finish the piece. It closes with a simple C-clasp. Primary colors never looked so good! This stunning early-1950s diamanté floral brooch by Miriam Haskell is identical to the "central motif" of a necklace shown in the Gordon & Pamfiloff book on this maker. There the centerpiece is described as "silver metal leaves edged with rose montées and two large clear rhinestones surrounded by smaller rhinestones". While the necklace is much more elaborate, this Frank Hess-designed piece is perfect for today, any time of day! And it would look gorgeous on a wedding gown. 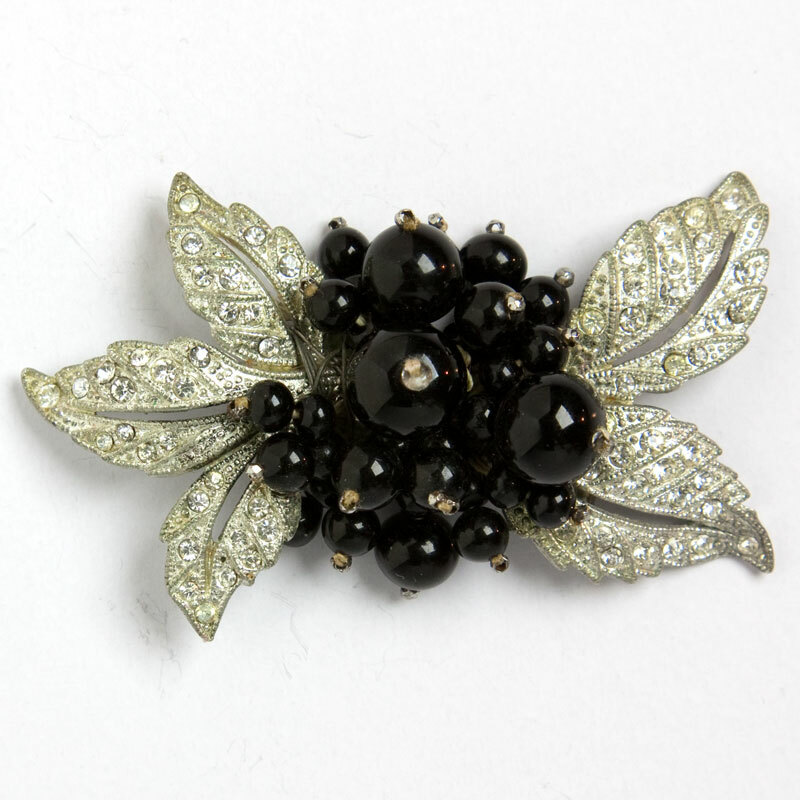 I bought this brooch for myself, but I am now reluctantly offering it to a new home. 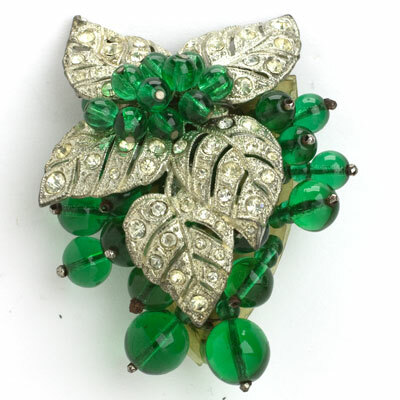 This well-known Frank Hess World War II design features a bunch of emerald glass beads atop and hanging from silver-tone metal leaves inset with diamanté. In typical Haskell style, the large beads have metal tips. The pierced plastic back is finished with a dress clip. This piece is unsigned, but its maker is well documented. At this stage of its life, this lovely dress clip needs to be handled with care, but it has retained its original beauty. These Miriam Haskell earrings feature three emerald glass balls dangling from clear glass tubes with rondelles at the center of blue-green crystal beads. 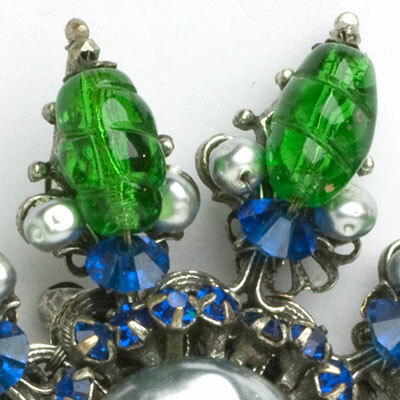 In typical Haskell fashion, the bluish-emerald crystal bead at the top is surrounded by a circle of clear glass beads, and the dangling emerald beads have clear glass tips. These all-original earrings have adjustable screw-backs (the combination screw and lever) and are signed. Great color and great movement! 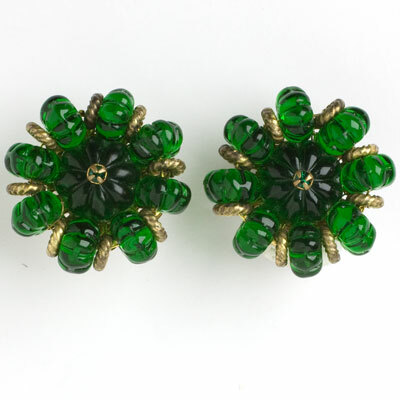 These Miriam Haskell earrings feature an emerald-glass melon bead capped with a tiny emerald glass stone covered by four Russian-gold prongs. 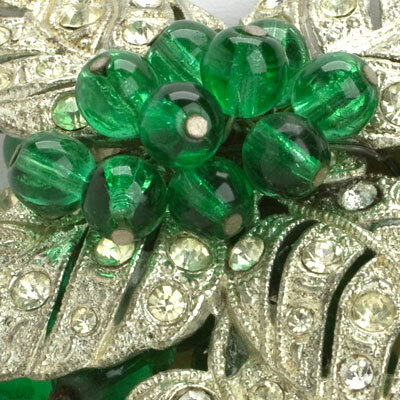 This centerpiece is encircled by smaller emerald-glass melon beads with twisted Russian-gold spacers. These components are wired together by hand and attached to a gold-tone metal filigree foundation. 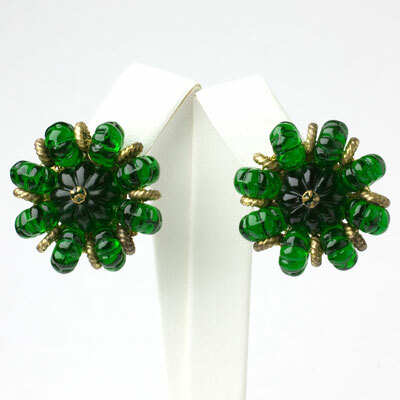 The short, flatback ear clips date this Frank Hess creation to the late 1940s. The color is divine, the quality is exceptional, and the design is timeless. These versatile earrings will take you anywhere in style! This Miriam Haskell pin is a real knockout! It features a large, pale-grey faux pearl in the center, surrounded by a ring of faceted, round sapphire-glass stones set in silver-tone metal. Ten rays emanate from there, each with a sapphire-glass bead; a ribbed, egg-shaped emerald-glass stone; and tiny faux pearl accents. The construction is superb: a scallop-edged, round filigree plaque supports the center and holds the pin with a roll-over safety clasp. Each ray is supported by its own round filigree plaque topped with a triangular frame. Because of the complexity of the brooch’s design, I suggest wearing simple pearl earrings and/or a pearl bracelet. 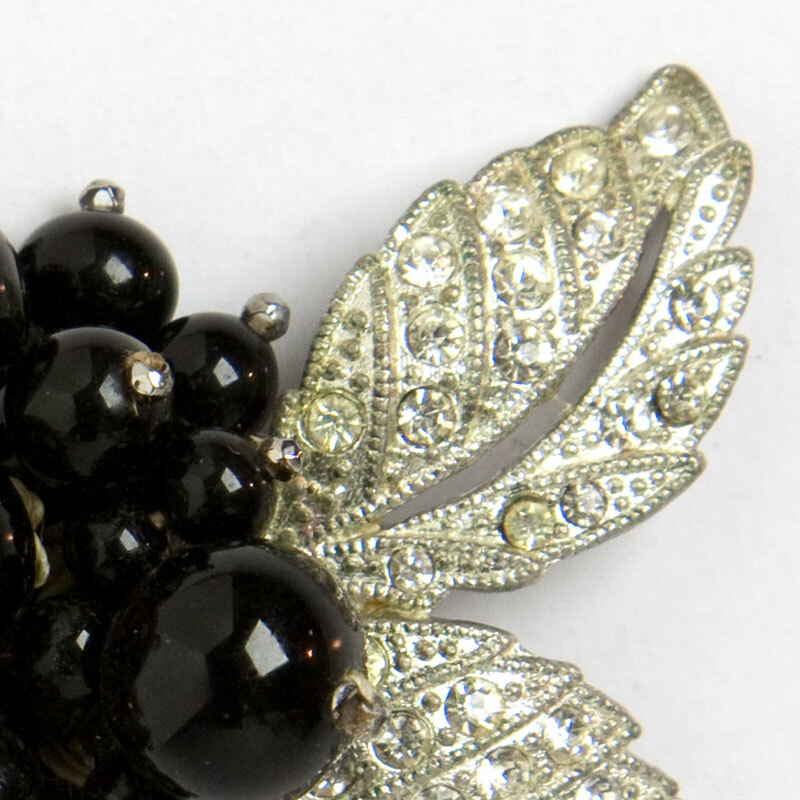 After all, the brooch should be the star of the show! 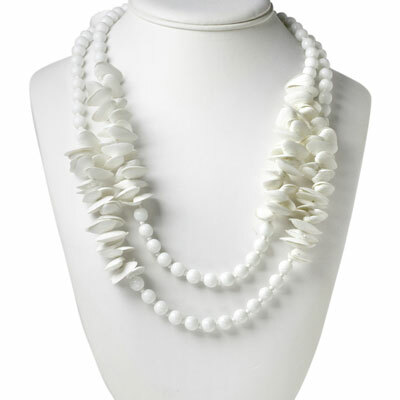 Molded frosted glass beads are the points of interest in this 1970s necklace by Miriam Haskell. A rondelle sandwiched between each pair of frosted glass disks and gold-tone spacers complete this versatile piece. It has been cleaned and restrung by my expert jeweler. Although this necklace was made more recently than the scope of this collection, I bought it because I like it and because it can be worn with virtually anything! 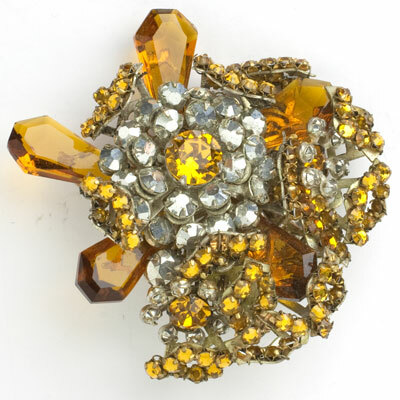 Large, faceted golden-topaz (or deep-citrine) glass stones, with the largest shooting out at various angles, form the bottom layer of this dazzling 1950s brooch by Miriam Haskell. 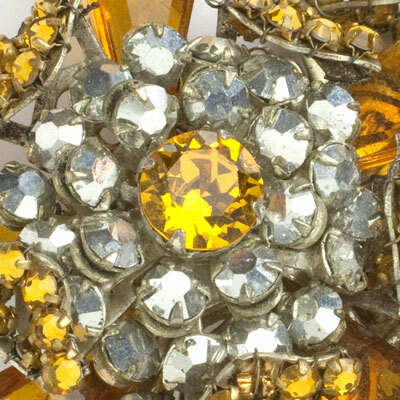 A large citrine glass stone in the center is surrounded by silver-coated diamanté to add to the sparkle. The back is silver tone filigree with a roll-over safety clasp. 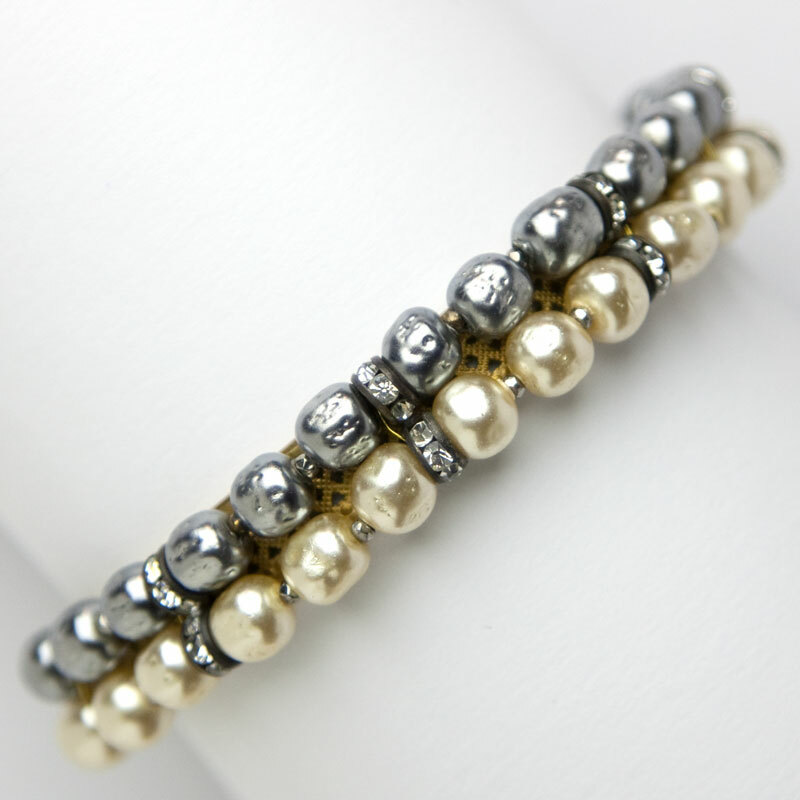 This Miriam Haskell bracelet has two-tones of baroque pearls and rondelle accents. The embellishments are wired onto a gold-tone hard-mesh-hinged bangle. It closes with a concealed clasp and safety chain. Pieces with these good looks and high quality never go out of style! 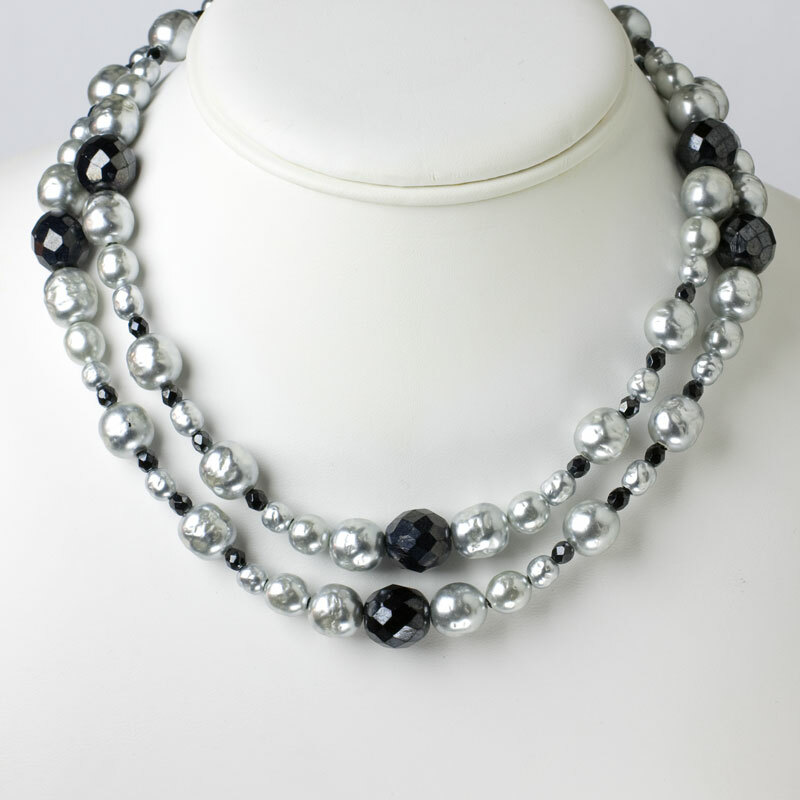 Scroll down to see a long strand of grey pearls with onyx beads by the same maker. 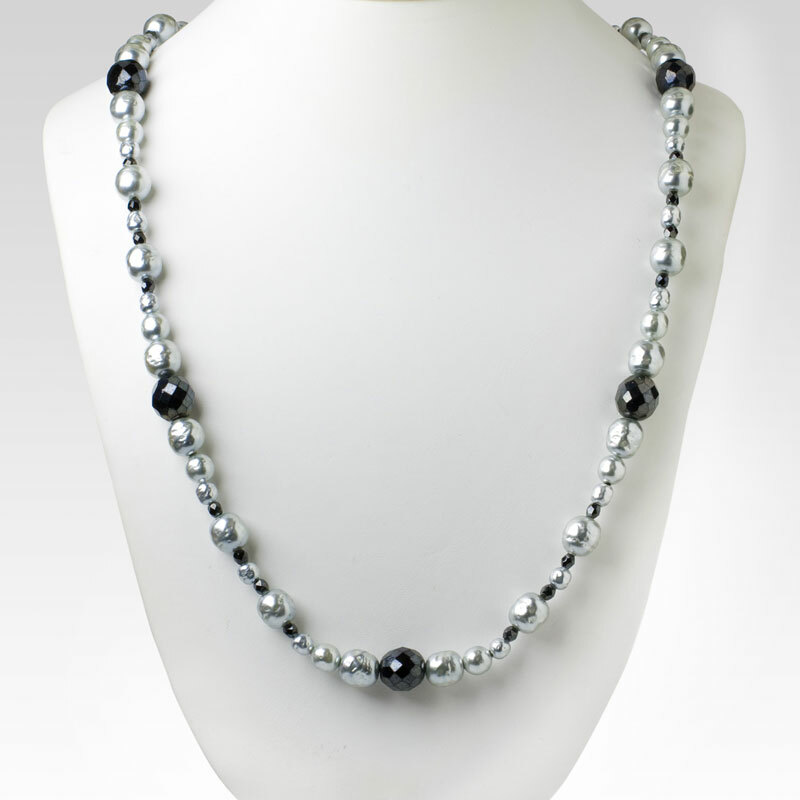 This long strand of faux grey baroque pearls is interspersed with faceted onyx glass beads, creating a striking necklace by Miriam Haskell. The variation in pearl and bead sizes and arrangement of the elements adds to the elegance of this piece. 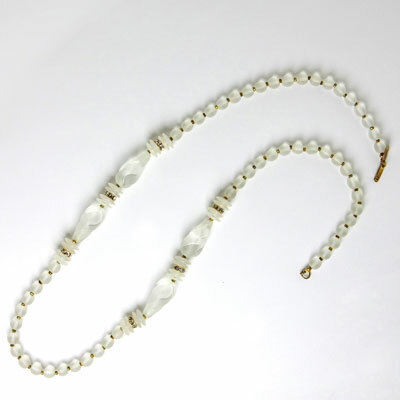 Wear it as a single long strand or doubled, depending on your neckline and the look you want to create. Although I usually prefer earlier vintage jewels, this lovely necklace was part of my personal collection because it is so elegant, timeless and versatile. The wear to the nacre of some pearls does not detract in any way from the stunning appearance of this piece. Scroll down to see another baroque pearl necklace and a bangle with grey and cream pearls, also by Haskell. 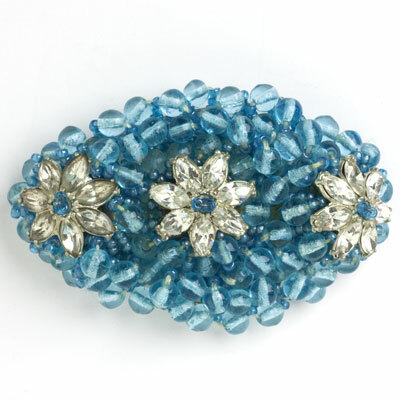 This pearl flower brooch by Miriam Haskell features a trio that forms a semi-circle. 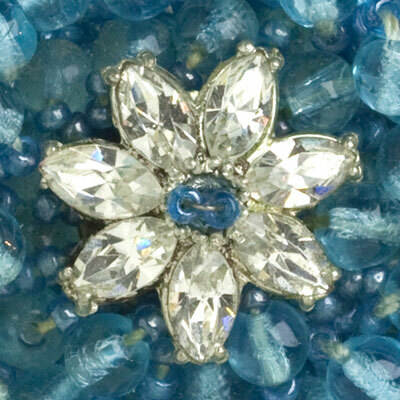 Each flower has a grey pearl center and engraved silver-tone petals. The components are wired onto filigree plaques. This jewel closes with a roll-over safety clasp. I’ve photographed the brooch in the vertical and horizontal positions, so you can decide which you like better. Great color and lovely detail! 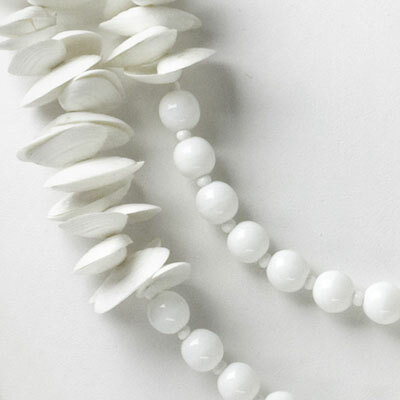 This 1970s necklace of milk glass beads and white sea shells was made later than my usual 1920-1960 scope, but this piece is so whimsical that I bought it anyway. This necklace can be worn long, doubled or even tripled! It closes with a slide clasp. This necklace works well with some of my other milk glass pieces, including a pair of earrings by Miriam Haskell — scroll down to see them. These 1960s milk glass earrings by Miriam Haskell have a scored drop topped by a round white bead surrounded by smaller white beads, a typical trait of this maker. These earrings have adjustable screw-backs (the combination screw and lever). Scroll down to see two more milk-glass pieces, a brooch and necklace both by Haskell, that look great with these earrings. This milk glass brooch has two rows of beads outlining a silver-tone metal filigree bow. This charming 1950s piece by Miriam Haskell closes with a roll-over safety clasp. You can wear this dainty brooch with sterling ball stud or hoop earrings or with milk glass earrings by the same maker — scroll down to see them. These adornments are perfect for those who look best in cool colors. 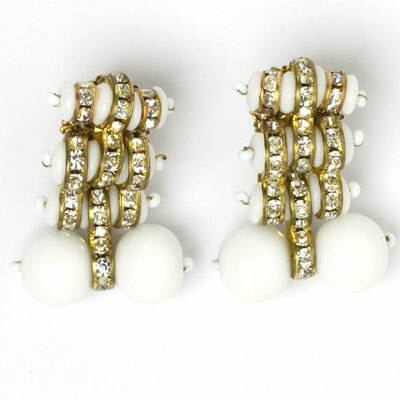 These milk glass earrings with beads and disks, rondelles, and gold-tone findings have a real Machine Age-look and associated movement. However, the use of French ear clips dates them to the late-1940s, and the white beads may take them into the 1950s, when white jewelry was extremely popular. I still consider this pair to be Art Deco in style, and I’ve seen the same motif used by this designer (Frank Hess) on earlier Miriam Haskell pieces. Whenever they were made, these ear clips are lots of fun! I saw them in an entirely new, bright, and glamorous light when they were chosen to walk the runway at Toronto Fashion Week for Spring 2019. See them on the model who looked stunning in a bridal jumpsuit with skirt. You don't have to be a bride to add glamour to an ensemble with these fabulous earrings! These vintage pearl earrings by Miriam Haskell from the late-1950s are fit for a bride or everyday wear. They feature a baroque pearl dangling from a pearl-studded Russian-gold-layered plaque. These earrings have adjustable screw-backs (the combination screw and lever) and are simple, yet elegant and easy to wear.